Dian Al-Mahri Mosque was inaugurated on December 31, 2006 and coincides with the implementation of the Eid al-Adha 1427 H by its founder Mrs. Hj Dian Juriah Maimonides Al Rashid and also Drs H. Maimon Al Rashid. This mosque is also called the Golden Dome Mosque, in accordance with the trademark that is contained in a gold-plated dome. First, powders of gold (prada) mounted on the crown / pillar. Both gold plating which is on the chandelier, ralling mezzanine stairs, railings mezzanine, calligraphy ornament containing rosary sentence on top of the vaulted ceilings and decorative ornament onstage mihrab. The third solid gold mosaics that are on the main dome and dome tower. The mosque, which has an area of ​​8000m2 is built on a land area of ​​70 hectares, and is also part of the concept of integrated development of a region and named Region Islamic Center Dian Al-Mahri. 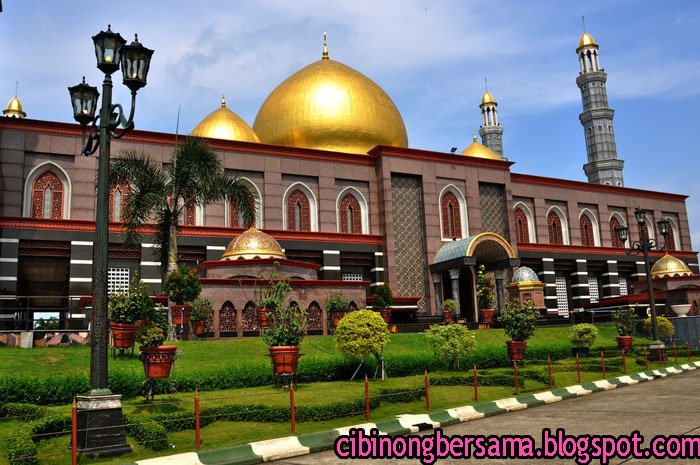 The shrine is also often referred to as a region grandest mosque in Southeast Asia. The mosque is able to accommodate about 15,000 worshipers to prayer and also the implementation of about 20,000 pilgrims for the implementation of taklim. The main hall of the mosque, measuring 45 × 57 meters which can accommodate 8,000 worshipers. The mosque has six minarets shaped hexagon and height each 40 meters. To 6 minaret is clad with gray granite originating from italy with a circular ornament. At the height of the minaret there is a dome which is covered with 24 carat gold mosaic. This refers to the dome of the mosque dome used in the mosques of Persia and India were wrapped with 24-carat gold-plated mosaic that material imported directly from Italy. At its domed ceiling there is a painting of the sky whose color can be changed according to the color of the sky at times of prayer. It is possible to use a lighting technology that is programmed with the help of computers. Golden Dome Mosque neighborhood Dian Al-Mahri in its development has emerged as one of the destinations of religious Muslims. This mosque region on weekends and holidays visited no less than about 50,000 jama`ah.